"All the things that I dressed like an idiot for seemed to be coming to nothing," remembers punk fanatic Billy Bragg about music in 1983. "We just seemed to have cleared the way for Spandau Ballet!" By another infamous account, the incendiary genre was long buried by that point. "Punk died the day the Clash signed to CBS," wrote critic Mark Perry about the band's 1977 major-label deal. The Clash were both blessed and cursed to be the biggest band bridging punk and post-punk. Their defining masterpiece was, fittingly, released at the end of 1979 in the U.K. and at the beginning of 1980 in the U.S. London Calling was a punk product, but didn't have a single straight-ahead punk song on it. It was emblematic of the Clash's implicit argument that punk was bigger than punk. Two new books track the band's history, and the one that promises to include All the Albums, All the Songs treats the band's 1985 album Cut the Crap better than the 2013 box set Sound System did: author Martin Popoff includes the album, which the compilers of the otherwise comprehensive box set didn't see fit to do. 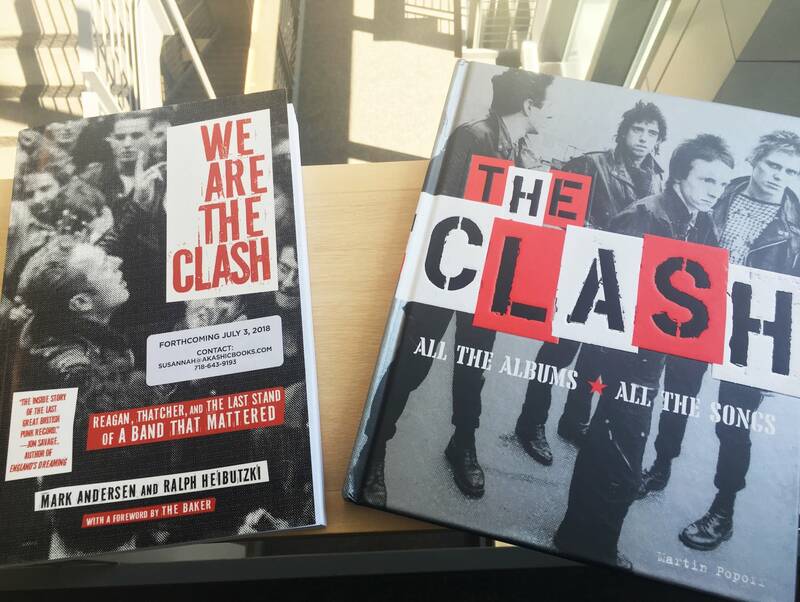 In We Are the Clash, Mark Andersen and Ralph Heibutzki devote 400 pages to the most unloved period of the band's history: the period from the September 1983 firing of Mick Jones to the November 1985 release of Cut the Crap, after which the Clash were through. Even Andersen and Heibutzki don't strain very hard to defend the album itself, which was chaotically produced by the group's prodigal manager Bernie Rhodes and has been widely panned. The authors are more interested in Strummer's strain to re-harness the power of punk to ignite opposition in the cynical Thatcher-Reagan era. The world needed the Clash more than ever, thought Strummer...except that it didn't, and a lot of fans didn't even want the new lineup. "Spanish Bombs" references the Spanish Civil War of 1936 to 1939, in which Francisco Franco and the Nationalist fascists took power, fighting a coalition of the left-leaning Republicans and anarchists. Franco ruled Spain until his death in 1975, and at the time of the writing of London Calling, the ETA and the Basque separatist movement in that country ws very much in the news. Strummer saw an opportunity to write about the current terrorist actions in Spain while drawing parallels to the sounds of Spanish bombs in the 1930s. Clash roadie Johnny Green was knowledgable about the Spanish Civil War and supplied Joe with reference material. Meanwhile, the Replacements used their roadie Bill Sullivan to troll their fans with renditions of Alice Cooper songs. Although Strummer was the most pointed lyricist in the Clash, Jones's expansive musical vision proved indispensable. One of the disagreements that led to his estrangement was Strummer's acquiescence in the stripping of Combat Rock from a sprawling double album down to a focused single disc. Jones was also interested in exploring new musical directions — as he'd later do in Big Audio Dynamite — while Strummer was concerned about diluting the band's aesthetic. We Are the Clash is too long: it's full of detail about Thatcher, Reagan, the striking miners, and the Cold War. While that context is critical to the authors' argument, the day-by-day weaving of historical events with Strummer's travails seems like overkill. By the time the band enters the studio at the end of the book, though, we do really feel their sense of defeat. The most amazing, and illustrative, story in We Are the Clash is one for the ages: in 1985, the Clash were busking in Leeds when they were attacked and splattered with red paint by...Chumbawamba. At the time, Chumbawamba were furious anarcho-punks who were sympathetic to Perry's view regarding the Clash and their eclectic, major-label music. Ironically, the fact that the band were on a pop-up busking tour, precisely as an attempt to get back to their punk basics, was one of the things that most annoyed Chumbawamba. "They'd done the America, champagne, and [cocaine] thing," said the latter band's bassist/vocalist Dunstan Bruce, "and they came back over here trying to prove that they could still relate to the kids. To me, it just smacked of insincerity." The red paint was a reference to a completely false rumor that CBS was somehow involved in the production of cruise missiles. Thus, artists like the Clash, Judas Priest, and Wham! were all "effectively funding possible nuclear holocaust," as Andersen and Heibutzki put it. "While exhilarated at the time," the authors note, Chumbawamba "would later look back on the action with ambivalence." Rock and Roll Book Club: 'The World's Greatest Music Festival Challenge' 'The World's Greatest Music Festival Challenge' asks readers to find legendary artists hiding in illustrations of festivals like Woodstock, Newport, and Glastonbury.